Nice holiday home on the ground floor of a Provencal villa. It is wonderful outside: you have a private terrace with garden furniture, a stone barbecue, table football, trampoline, Boules game and a spacious lawn with a swing. Behind the hedge you'll find a fenced swimming pool with outdoor shower and sun terrace with sun beds that you share with the friendly owners. By the way, they won't use it much during your stay. 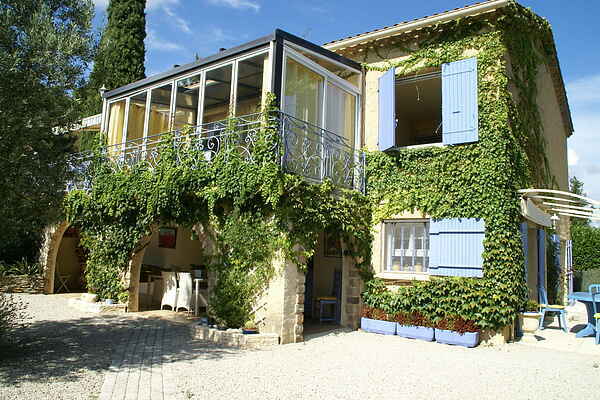 This home is near Piolenc (1.5 km) in the far north of Vaucluse, near the borders of the regions Gard, Ardèche and Drôme. The famous Roman city Orange is only 6 km away. In the old city centre you can take a nice walk along the theatre, town hall and on your way you can rest in a cafe on one of the many Provencal squares. For an active day you can visit the Ardèche with the famous Gorges de l'Ardèche (30 km) for a day of canoeing or kayaking in this impressive river. Also visit Vaison-la-Romaine, Carpentras, Avignon and the Gard bridge. In Pierrelatte you'll find Europe's largest crocodile farm.